Testing by Clarins indicates lasting power should be 4 hours long. I experienced about the same and found these lasted between 3 to 4 hours if the lips are not touched by coffee cups, tea cups, soda or snacks. They have Wild Mango extract, shea butter, Vitamin E and a plant-extract from rice bran oil. 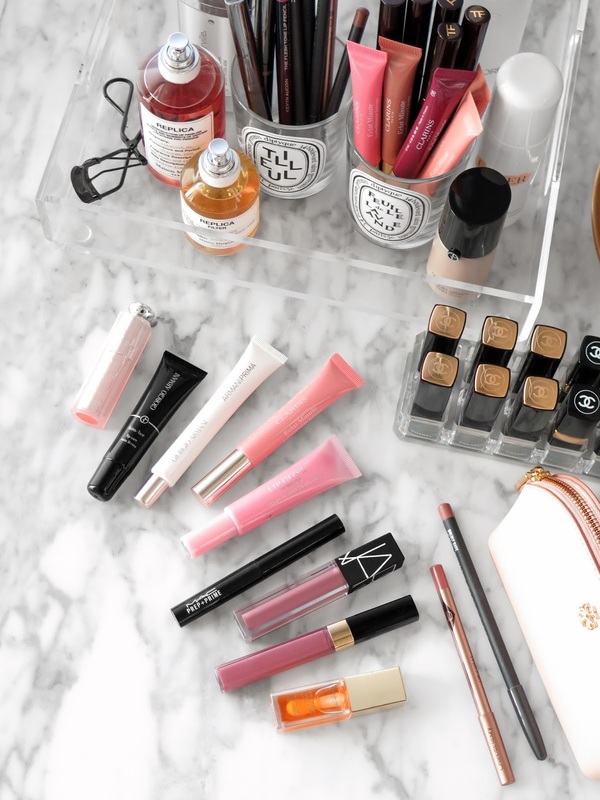 I found these to be the most pleasant-feeling tinted lip balms I’ve tried. There is a slight sweet vanilla scent but it’s very subtle and not overpowering. 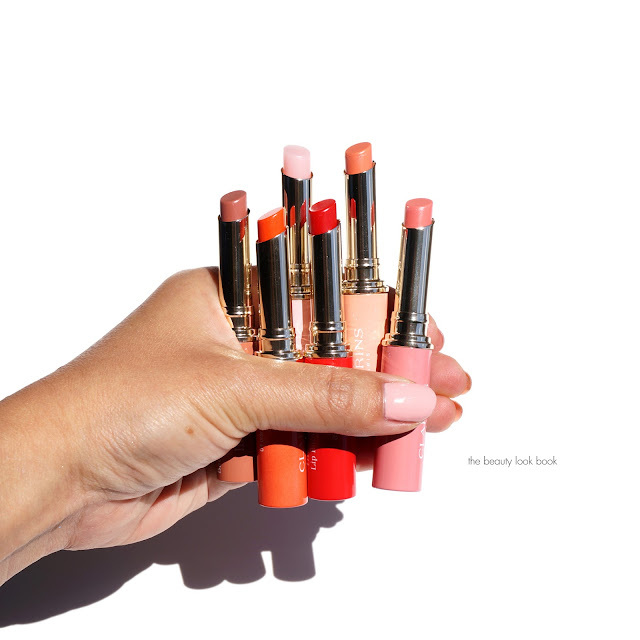 I’ve been really obsessed with the formula – they are sheer, glossy and add the perfect amount of color to the lips. They feel really amazing on my sensitive lips and leave them feeling smooth and well hydrated. The only downside to these balms is the amount of product in each tube so the price per gram or oz is pretty high. These have 1.8 g and by comparison Fresh Sugar Shine Lip Treatments have 4.3 g and L’Occitane Peony Tinted Lip Balms have 4 g of product. I know many will want a comparison to other tinted lip balms – I would say the concept is similar but the texture is completely different. Fresh is thicker and softer in texture. Some of the brighter colors will give much more pigment and color payoff on the lips. L’Occitane’s lip balms have a harder texture and have more slip to them – they glide on and look more like a velvety stain. 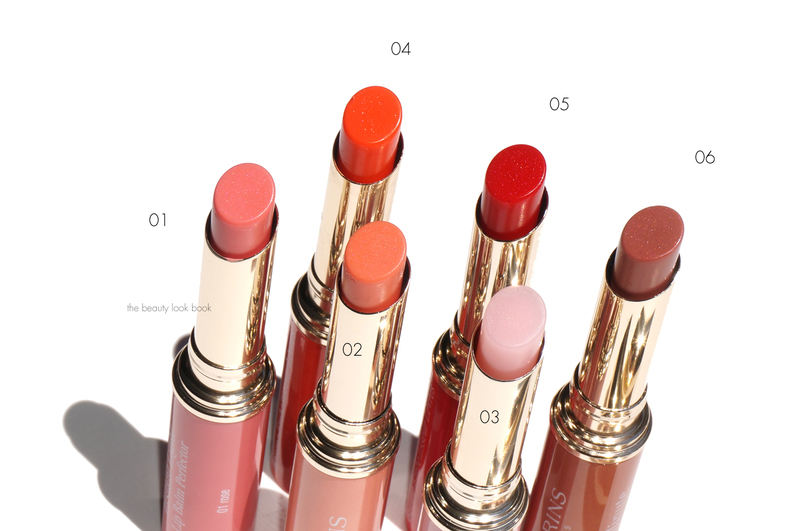 The Clarins by comparison is a lot more glossy and feels more hydrating on the lips. Swatches and close ups of all six shades. #03 My Pink is a self-adjusting shade adapts to the pH of lips – on me it turns into a rosy healthy pink. 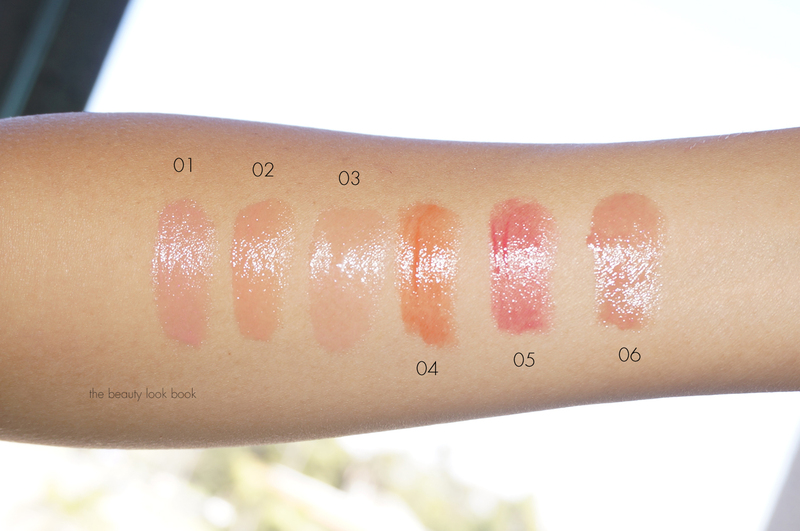 Note that the swatches on the arm for #03 is a light pink but on the lips it will adjust/brighten depending on your pH. Lip swatches below. For skintone reference I’m wearing Chanel Perfection Lumiere Velvet Foundation in Beige 40 with Urban Decay Naked Skin Ultra Definition Powder Foundation in Medium Light Warm. 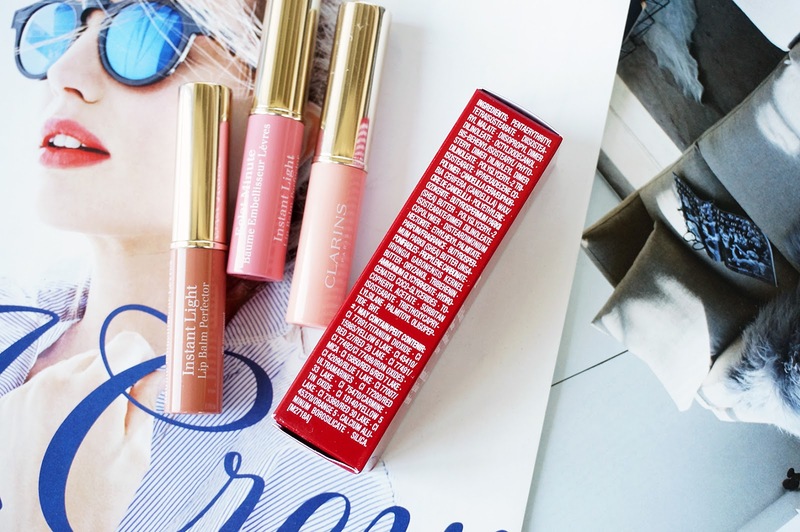 Bottom line: the formula of the Clarins Instant Light Lip Balm Perfectors is a winner in my beauty book. They feel hydrating on the lips and there is enough color in these balms for them to show up on my pigmented lips. A closeup look at the colors show there is a tiny bit of shimmer in them but on the lips they look shimmer-free. Just naturally glossy and shiny. 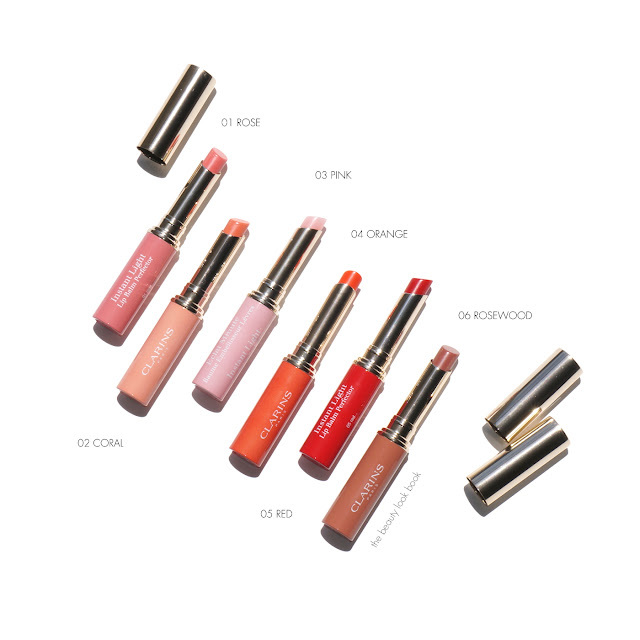 If you want something with similar shine and feel but with more color I would suggest looking into YSL Rouge Volupté Shines or Chanel Rouge Coco Shines – however those aren’t as hydrating as these Instant Light Lip Balm Perfectors. If you can get over the small product size (or the price per ounce) then these are ones I know I’ll use up entirely (where some lip balms take me forever to use). They are nice to throw in the purse for quick shine and touch ups and feel super nice on the lips. I recommend checking out at least one. There’s nothing else I’ve tried that makes the lips look as healthy and naturally plump as these. I’ve been testing these for a couple months now (sorry it took so long to post this review) and I’m already almost finished with Rosewood and Coral. The Clarins Instant Light Lip Balm Perfectors retail for $24 each. You can find them at all Clarins retailers, online at Clarins.com, Macy’s, Nordstrom, Bloomingdale’s, Lord and Taylor, Saks Fifth Avenue, Harrod’s and Selfridges. The Clarins Lip Balms were provided for review consideration. As always, opinions are my own.